On October 31st the Church commemorates what was perhaps the greatest move of God’s Spirit since the days of the Apostles. 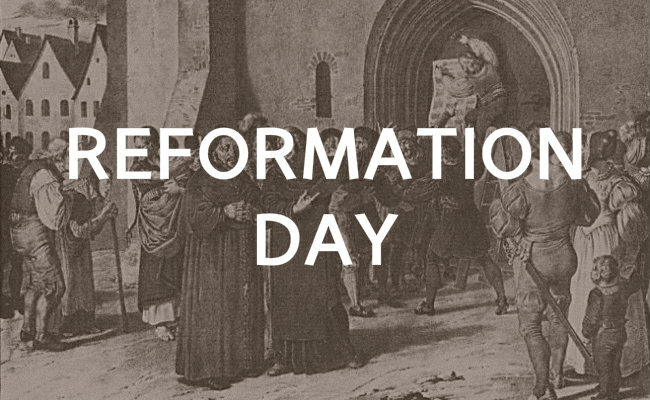 On October 31, 1517 Martin Luther nailed his ninety-five theses to a church door in Wittenberg, Germany that provoked a debate that culminated finally in what we now call the Protestant Reformation. Martin Luther was an heir of Bishop Augustine of Hippo. He was a law student turned Augustinian monk. He Initially protested the pope’s attempt to sell salvation. He diligently studied scriptures and was lead by the Holy Spirit to deeply understand and proclaim the primacy of the Bible over church tradition and the means by which we are found righteous in the sight of God. He also translated the bible into German and put the Word of God in the hands of the common people which the Catholic church violently opposed. Following in the attempts by godly men before him like John Wycliffe (1384AD) and Jan Hus (1415AD). The Catholic church even banned John Wycliffe's writings and burned Jan Hus alive along with digging up the remains of John Wycliffe in 1428AD and burning those as well. But that didn't stop the Holy Spirit from moving in the hearts and minds of those who were called. In 1518 Huldrych Zwingli wrote very similar things about the corruptions in the church with out even knowing Martin Luther or reading his writings. These men were compelled by the Holy Spirit to call for the repentance of the Catholic church. In 1530AD William Tyndale did the same and was later executed for it in 1538AD. As the Holy Spirit continued to move within the hearts of believers like John Calvin and John Knox who also spoke out in 1536AD and 1540AD. It wasn't until with The Peace of Westphalia of 1648AD that the reformation settled and the reformers were less oppressed and persecuted by the Catholic church. Martin Luther chose to do this a day before the church wide celebration of 'all saints day' on November 1st. The date was set by Pope Gregory III, who dedicated a chapel in honor of all saints in the Vatican Basilica then In 837, Pope Gregory IV (827-844) ordered its church-wide observance. Then the next day, November 2nd is 'All Souls’ Day' for prayer and almsgiving in memory of ancestors who have died. People pray for the souls of the dead, in an effort to hasten their transition from purgatory to heaven by being purged and cleansed from their sins. The concept of purgatory was made official church doctrine at the 1274 Council of Lyons. The council wrote that Christians who had not shown sufficient repentance for their sin needed to be cleansed by purgatorial punishments. Furthermore, the council taught that these punishments could be relieved for oneself (or for those who had died) through “the sacrifices of Masses, prayers, alms, and other duties of piety.” A teaching that focuses on works, materials, worldly things, and an invented concept called purgatory which is foreign to scripture. Sacred Tradition (not stated in scripture) is equal to Holy Scripture. Restrict, control, and limit the translations of Holy Scripture in common languages. The Catholic church only authorized bible translations in a language that common people could not read thus leaving people utterly dependent on bishops and pops. The authority of the position of Pope which is no where found in scripture and is not mentioned in church history till 400 years after the Apostles. Papal simony and nepotism. Nepotism is the favoring of family members for bishop and papal positions. Papal simony is the monetary or material payment for spiritual services or church positions. Like using money to pay for sin. Church usury. Usury is requiring interest on a loan. The Catholic church would offer loans but would require extreme high interests where people would not easily get free from owing the Catholic church. Unifying Principles of the Reformation are known as the Five Solas (Alones). The authority of Scripture Alone that teaches Salvation is through Christ's Works Alone, by God's Grace Alone, through Faith Alone, all for God's Glory Alone. For close to 1,000 years the single unified church (catholic church, low case "c") continued to drift away from dependence on God and heavenly things and more on man and worldly things. The reformers were raised up by God to convict the church and redirect the focus back on God and eternity. Parts of the church remained unrepentant and unwilling to concede to the absolute dependence on God and has remained as the Catholic church (with a capital "C"). Even today, the Five Solas help guild our hearts and minds into a deeper understand and reverence of God. 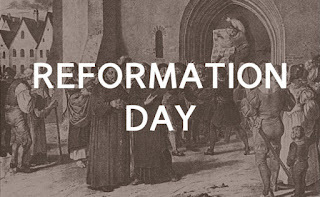 It is mankind's natural tendency to drift away and depend on our selves, our possessions, and efforts; so the reformers and the principles of the Reformation remain valid and extremely important today.